With enriched market experience, we have been able to offer a wide spectrum of Pendant Set. We have marked a dynamic position in the market by providing the finest quality range of Designer Ladies Pendant. 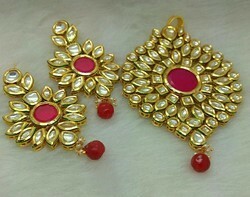 peacock Style polki and kundan pendant set with single gold balls line , designed by our inhouse designing team we provide latest designs in high end fashion jewellery , we are manufacturers , wholesalers and exporters of designer indian ethic jewellery. We are instrumental in manufacturing a wide gamut of Acrylic Stone Pendant Set for our clients.